Just when you thought it was safe to go back onto the racetrack, Sega announced on Monday that Sonic and Sega All-Stars Racing will be coming soon to the iPhone and iPod touch. This chaotic and cartoonish racer will feature a full lineup of iconic Sega characters, multiplayer support, and an intuitive interface that will let you race and battle against your friends. So be prepared to toss bombs from your race car, throw missiles at your friends, and zip to the finish line in this crazy racer for the iOS. The most recognizable character in this new franchise may be Sonic the Hedgehog, but he’s not the only one along for the ride. Consisting of characters from a variety of iconic Sega games (including Sonic, Tails, and Dr. Robotnik from the Sonic series, Aiai from the Super Monkey Ball series, and Billy Hatcher from the lesser known Billy Hatcher and the Giant Egg), Sega is rounding out the cast with a variety of memorable (and obscure) characters that will hopefully appeal to a wider audience than just die-hard Sonic fans. During out hands-on demonstration, we got to take this new racer for a spin. The final build will feature ten characters from various Sega franchises, though the build Macworld saw only included Sonic, Tails, Aiai, Dr. Robotnik, and Billy Hatcher. 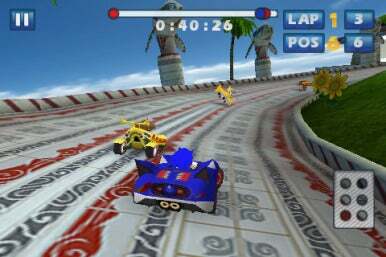 Each character has its own unique racing machine, from Sonic’s blue sports car to Tails modified airplane-like-machine. The graphics are 3-D and cartoonish but instantly recognizable. You’ll see skidding, explosions, and lots of colorful effects as the racers bounce around the track. You’ll also have both tilt and gesture based controls (plus virtual buttons) to utilize as you accelerate, pick up power ups, and drift. But what good racing title is complete without an arsenal? While you’re racing around the track, drifting, accelerating, and avoiding obstacles, you can also ensure your opponents’ demise. With the use of explosive orange cones, boosters, rockets, homing missiles, bombs, and other power-ups, there will be plenty of danger to avoid and plenty of pain to dish out. And you won’t be doing it alone, either. Sega revealed that the game will have not only a full single-player campaign, but a robust set of multiplayer modes as well, including local multiplayer matches via Bluetooth and Wi-Fi. The pre-alpha demo had only four levels, including a oceanic-themed level called Whale Lagoon, a wintry road called Icicle Valley, a jungle-themed map called Treetops and a more industrial neon-infused course called Shibuya Downtown. Of the four levels, the Whale Lagoon level seemed the most polished and the most-ready. In Shibuya my opponent and I kept missing the power-ups that we mutually attributed to a bug. That said, on the whole the game looked pretty far along and definitely addictive. 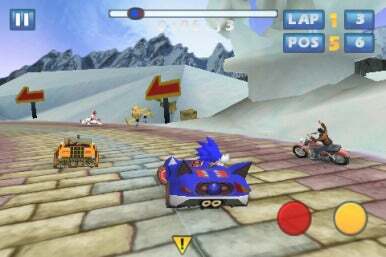 Combining iconic characters with power-ups in a racing title isn’t the freshest idea Sega has ever had (see Nintendo’s Mario Kart and Rare’s Diddy Kong racing games) but so far there have been very few memorable racing titles on the mobile platform. This Spring, Sega may be able to change that.